Everyone has a favorite type of BBQ. What is yours? Texas? Memphis? 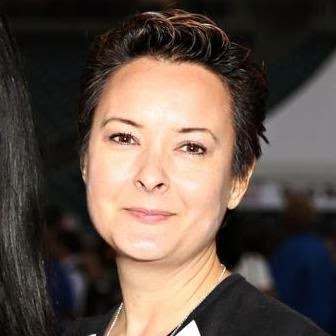 Carolina? I don't care for Texas because it is just too smokey for me. Otherwise, I like other BBQs as long as I like their sauce. But another important factor besides the sauce or rub is how well the meat is cooked. Is it dry or moist? How tender is it? For the last few years my BBQ joints of choice had been Sandra Dee's and Memphis BBQ. Alas, Memphis died along with this economy. So I was left with Sandra Dee's. Now I have a new option - My BBQ Place on J St. I first heard of it from Epicurean's Paul. He took his dinner group there a couple of months ago and I had to miss it. Today I had a craving for some ribs and decided to search the place out. It is easy to miss. It is a small place in a building between other businesses. Even though we were looking for it, we still managed to drive right past it. We found a parking spot and then walked back on the block until we spotted it. I ordered a half slab of babybacks which came with fries and a choice side. I chose the mac n cheese. Jim ordered a combo plate with a half slab and beef brisket. He got two sides and chose the baked beans and cornbread. We were asked if we wanted our meats wet or dry and whether we wanted mild or spicy sauce. I always choose dry because I hate getting ribs so sopping wet with sauce that I have to scrape it off. I'd rather add than subtract. Jim chose wet with mild sauce. Below you see his ribs and I was glad to see they had a nice light coating of sauce - just the right amount. The food arrived and we saw that we had plenty. We probably could have just ordered the combo and shared it between the two of us. The ribs were excellent. They were super moist and fell off the bone. 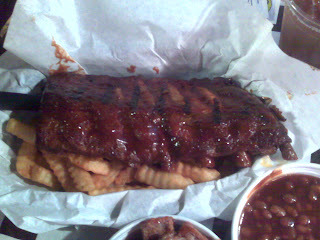 After some time savoring them and thinking about it I would have to say that I prefer the ribs here over Sandra Dee's. SD's ribs tend to be on the dry side. These ribs were succulent. We both enjoyed the sauce as well - sweet and tangy. The hot was the same as the mild just ratcheted up a notch or two. We both liked the beef brisket as well, especially how it was served. You see it above in the left cup, cut into cubes. This treatment made it easy to eat with a nice, light toss of sauce. The mac n cheese was nothing special so on that I prefer SD's. I didn't try the cornbread, but the baked beans were good, but seemed like they could have been canned versus homemade. So the overall judgment? 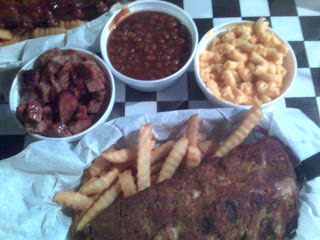 I like the ribs, brisket, and sauce here better, but I prefer the mac n cheese and red beans and rice at SD's. And, we must remember, Sandra Dee's is still THE winner for fried chicken.